“Clean eating” and “Paleo” are all over the place these days, and I’m kind of intrigued. Generally speaking, the Paleo diet focuses on eating like a caveman — things that were around 10,000 years ago, like meat, fish, vegetables, fruit, healthful oils, etc. I still need to do some research, but from what I can tell, the biggest difference is that clean eaters can have grains and Paleo followers should not. I’m in the middle of the Insanity workout, playing soccer four days a week and trying to reduce (ideally eliminate, but one step at a time) the bad-for-you things I occasionally put in my body. And we’re still in the thick of Girl Scout cookie season, so that’s not always an easy task, especially when you have a weakness for the delicious, caramely, coconuty Samoas. Fortunately, Elana’s Pantry posted a Paleo Samoa recipe that caught my eye, and I decided to try out my first caveman confection. A few notes: I don’t think budget is an excuse for eating poorly; if you plan it right, you can buy a week’s worth of healthy foods for the same amount as two meals at Wendy’s. That being said, clean eating is expensive. More than likely, you will have to hit a more specialized supermarket like Wegmans, Trader Joe’s or Whole Foods to find what you’re looking for, and you’re going to pay significantly more. It’s up to you to weigh the pros and cons. Also, I botched two steps in this recipe, so these cookies are like, the Samoa’s cousin — a reverse Samoa if you will. (I stupidly dipped the tops of the cookies in the chocolate instead of the bases, and then I put the toasted coconut in the chocolate instead of the caramel.) There are a lot of steps in this recipe, but nothing too challenging. They are coated with dark chocolate and drizzled with a vegan caramel. The end result is a tasty organic cookie that serves as a healthier bit of indulgence at the end of your meal (or in the middle of the day when you’re craving something sweet…which happened to me three times today — eek!). Preheat oven to 350 degrees. In a food processor (recommended — I admittedly used my Kitchen Aid mixer), combine almond meal, coconut and baking soda. Pulse in honey, vanilla, egg and melted coconut oil until dough forms. Put the dough in the freezer for 30 minutes or until firm. Roll dough between two pieces of parchment paper until 1/4 inch thick. Use a 2-inch round cookie cutter to cut out cookies. You may also cut out holes in the middle for a more authentic-looking Samoa. Bake on parchment paper for 6-8 minutes. Allow cookies to cool completely before dipping. In a double boiler, melt dark chocolate. Meanwhile, toast coconut in toaster oven until just browned. In a separate saucepan, combine sugar, nectar and milk. Bring to a boil, then reduce heat and let simmer for 10 minutes. Once cookies are cooled, dip the base of each cookie in the chocolate mixture and place on parchment paper to set. Remove caramel from heat and mix in toasted coconut. Drizzle a small amount of caramel over each cookie. 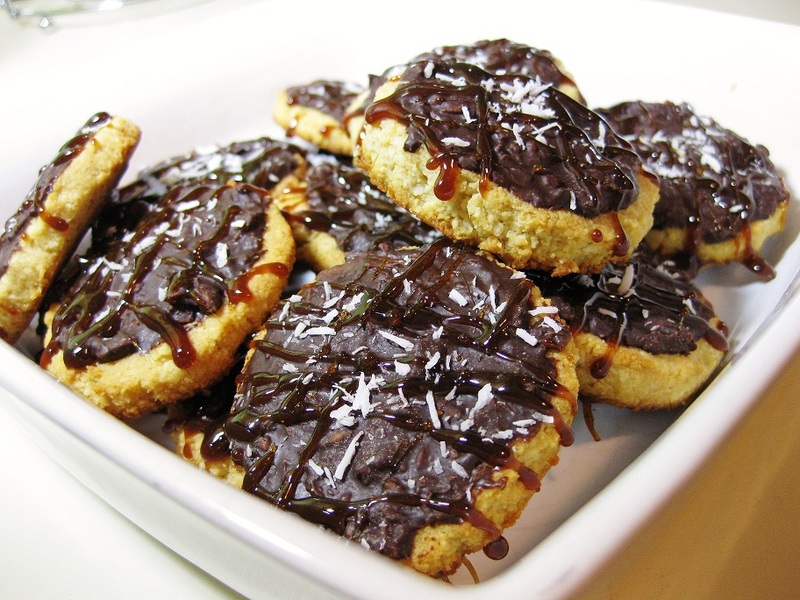 If desired, top with additional chocolate and/or toasted coconut. Allow to set in the fridge. Calories? About 95 calories per cookie. Total time? 8 minutes baking, 10 minutes for caramel, 10 minutes prep. Overall success relative to expectations? 8 out 10. These cookies have certainly opened my eyes to how great a “clean” dessert can taste. They’re not necessarily low-calorie, but I felt less guilty about dessert knowing that all the ingredients are organic. As I mentioned, I didn’t follow the directions exactly and these don’t look much like Samoas (nor are they very pretty in general), but they sure were tasty. I docked points only because I felt they were a little light on coconut. It’s best to keep these in the fridge (and I prefer to eat them on the colder side). One other thing worth mentioning is that the caramel is very sticky and you may end up with a little in your teeth after the cookie is gone. Small price to pay, though, amIright? This sounds awesome. I’m doing a nutrition challenge for my gym this month and it’s not as easy as it sounds. We’re supposed to follow 100% clean, so it’s always great to have awesome recipes like this to help out! I will definitely give it a try!! Thanks I’m sure I will! !